Welcome to Verve's New Release Spotlight Hop! Verve is releasing a brand new set, coordinating word die and a couple of shaker mixes today, and the new goodies are available right now in the Verve store! You should have arrived here by way of sweet Marisa! If not, start the hop at the Verve Stamps blog so you don't miss any of the chocolatey goodness! Want to win some shiny new Verve? We'll be picking a random commenter on one of the hop spots below to win the new release! So be sure to leave a little comment on all the blogs below to increase your chances! Check out the Verve Blog today for a little more about our new products and all the prize info! As you can see, I used the sentiment and sundae image from the new Chocolate stamp set with the fabulous new Chocolate Word Die! There are some awesome dies from previous releases on my card, too... Jotted Heart Die, Hearts & Swirls Frame Die, and Pennant Trim Die. To finish off this chocolatey card, I added a bow from the Polka Dot Basics Ribbon Collection and some gold sprinkles from the new Shaker Mix! I'm in love with this new release! How about you?! You'll definitely want to stop by each of the Verve designers' blogs for some YUMMY inspiration and comment for a chance to win the release! Your next stop is the fabulous Teresa! Gorgeous design! I love the monochromatic look! I love the lacey bit peeking out there - you've showcased these fun new products beautifully! love this card! The chocolate ribbon really tops it off! Verve always has unique designs. Love the card!! Love chocolate and this entire new release. So lovely and feminine and I love that parfait!! I think I love your card more than chocolate, Stacey!! That should indicate to you just how beautiful your card is!!!! Love how you have combined the different ingredients to have a stunning end result!!! This card is scrumptious....most chocolatey. Love the layering and the boldness. Fab card. Love the layers and colors. Awesome Stacey! I love the Chocolate stamps! so pretty Stacey! Love it! Wow, pink & chocolate - great color combo! Love how you stamped on the printed paper. Great touch with the doily, too. Your card makes me want a huge bowl of IceCream, smothered in CHOCOLATE! Awesome! Love your mix of colors and papers! Perfect sentiment! I like the nice chocolaty colors you used. Stunning card. Such beautiful layers of paper, dies, doily and wonderful embellishments. I'm with you....love this new release and can't wait to order it. Oh no!! Now I want a chocolate sundae! LOL I love your card! 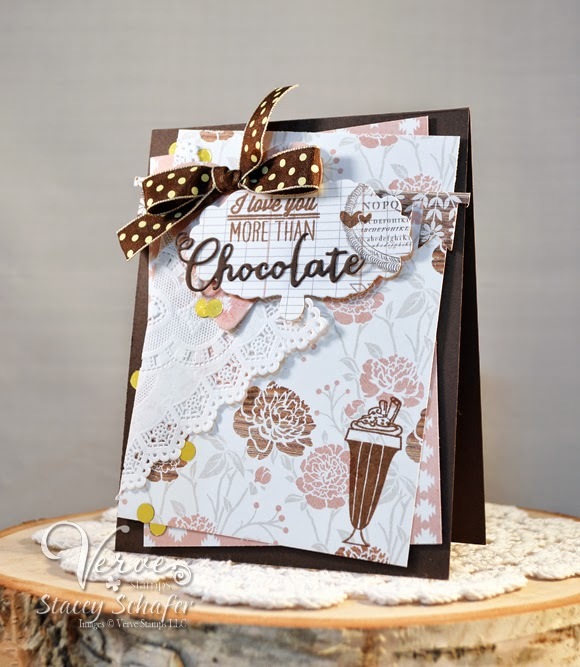 The paper you stamped the sundae on is gorgeous and goes together so well with the chocolate theme! Oh how pretty. Love the paper you used and how you laid it all out. Chocolate is good! Your card is wonderful. Love it. Thanks for sharing. That little bit of lace caught my attention first. I love the colors and all the patterns! Great job! Beautiful as usual, Stacey! Love the layout! 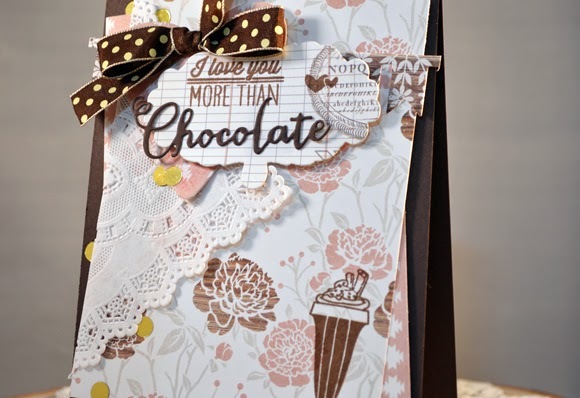 OMG Your card is so cool looks like the soda fountain of the 50's and the time when chocolate was a luxury...you truly came up with a super clever and creative card packed with lots of fabulous ideas and lot of the vintage feel. Great creative job! YOU so ROCK! oh this is just so yummy! Yummy card, I love the colors a lot. The pretty floral papers, doily and cute polka dot ribbon all come together beautifully! Great new stamp set! Gorgeous! Great design with all the layers and the perky bow~! Just love your Chocolate card and love all of the new release, I’m off to hop!! TFS. Sweet layers! love the sentiment and the cute polka dot ribbon! A little chocolate soda would be good right about now. Such a lovely, chocolatey card. Such a pretty card and now I want some chocolate! Wow! I love the skewed panels and all the yummy papers. They go perfectly with the chocolate theme. Your card is so pretty! It is eye appealing -- love the look of lace and the cute bow. Thanks for the inspiration. Sweeet--I like the layers and the polka dot ribbon. Love! And the polka dotted bow is the perfect touch. Such a beautiful card! Great colors and layout and I love how you stamped the "soda" image on the dp; looks like it belongs there. Love all those amazing layers! Mmmm chocolate, that's my kind of card!! Very pretty Stacey! So happy you used the milk shake stamp. Love the touch of pink! Love the card it is really cute. This fab creation is totally adorable, love your style! I love the paper. It really compliments the sentiment. I think I already have it and now I must have the stamp! I love your layers, with all of those lovely patterns. And the touch of lace is so pretty. This release is just awesome! The addition of the square doily is beautiful! This is the yummiest card I have ever seen. So pretty. Yum - such a pretty card! Love the square doily and spangles on your amazing card! Beautiful. Love the design and great new Verve products. Such a sweet card, I like everything about it! Such a CUTE way to use this stamp set...! Makes you want a shake. Screams chocolate malt time. Great card. I love the brown polka dot ribbon you used!! So fun! how sweet and delicate card! Just gorgeous and I love the little peek of doily!